Welcome to the IAA Observational Cosmology Research Group homepage! J-PAS is a new astronomical facility dedicated to mapping the observable Universe in 56 colors. The 2.5m mirror of the main telescope, combined with a 1.2 Giga-pixel camera containing an array of 14 CCDs, will produce high-quality images and a unique spectral resolution over the whole area of the survey, casting a new picture of the cosmos. The starting date for this multi-purpose astrophysical survey is 2013, and during 5-6 years we will observe more than 8000 square degrees (about 1/5 of the whole sky), using 54 narrow-band filters and two broad-band filters, covering the entire visible region of the electromagnetic spectrum (3500 Å to 10000 Å). This is our main project with the participation of all our members and with Dr. Txitxo Benitez as Principal Investigator and Scientific Coordinator. For more information about this project, please visit http://j-pas.org/. The Universe has proven to be far more intriguing in its composition than we knew it to be. It is a “dark” Universe where 23% of its mass-energy density is made up of weakly interacting (and, as yet, undetected) non-baryonic particles (a.k.a. dark matter) and 73% is as yet unknown physics (a.k.a. dark energy) that is driving an accelerated expansion. To shed new light on these mysteries, we are coupling the gravitational lensing power of 25 massive galaxy clusters with HST’s newly enhanced panchromatic imaging capabilities (WFC3 and the restored ACS) to test structure formation models with unprecedented precision. Our role on this project is to provide accurate photometric redshifts, providing estimations of the distance of the most farest galaxies in the Universe. For more information about this project, please visit http://www-int.stsci.edu/~postman/CLASH/. 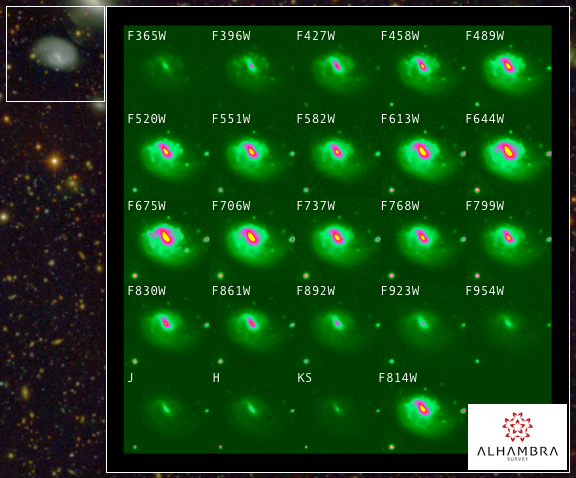 After having learned and thinked a lot in my HST work about the best filter systems to measure photo-z, we proposed and got time for the ALHAMBRA Survey, which is observing 4 square degrees of sky with 20 optical filters +3 NIR and will obtain unique data to describe the evolution of galaxies with cosmic time. For more information about this project, please visit http://www.alhambrasurvey.com/.